Score extra points with game fans when you serve these winning bars. Preheat oven to 350°F (175°C). Place butter in 13 x 9 x 2-inch baking pan; heat in oven until melted. Remove from oven. Stir together graham cracker crumbs, cocoa and sugar; sprinkle over melted butter. Stir mixture until evenly coated; press evenly with spatula onto bottom of pan. Pour sweetened condensed milk evenly over crumb mixture. Sprinkle with chocolates and toffee bits. 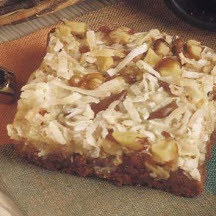 Sprinkle nuts and coconut on top; press down firmly. Bake 25 to 30 minutes or until lightly browned. Cool completely in pan on wire rack. Cover with foil; let stand at room temperature several hours. Cut into bars.